Ever wondered why your dog still scratches and itches even after a flea bath, like it still has fleas? It's because your dog has FLEA-BITE DERMATITIS - an allergic skin reaction to wherever the fleas have been on its body. This skin problem MUST be taken care of, or the suffering will continue. EQyss Flea Bite Shampoo and Spray are GUARANTEED to eliminate both of these problems. It is the only system that combines ingredients which control discomfort caused by fleas, while offering the benefits of a high quality moisturizing formula that is very gentle to the pet. Flea-Bite is completely safe for both yourself and your animal BECAUSE IT IS MADE FROM LEMONS. EQyss Flea-Bite Shampoo and Spray contain an exclusive trademarked ingredient developed from NASA research on the decontamination of astronauts, which makes this formula different from any other flea product. Environmentally friendly. Promotes healthy skin and coat. DEA FREE. 100 % SAFE Safe for dogs, cats and puppies. Always mix by shaking before use. Wet your animal's coat and work Flea-Bite Shampoo in thoroughly. Let the shampoo remain for up to 5 minutes and then rinse completely. In order to provide maximum relief for your pet and achieve the best results, it is recommended that this product be used in conjunction with Eqyss Flea Bite Spray. Once coat is completely dry, mist entire coat with spray. 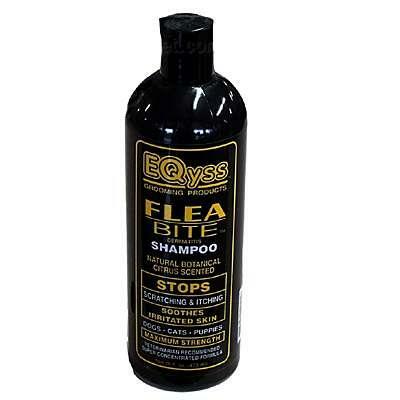 Unlike most Eqyss Products, Flea-Bite Shampoo should not be used on humans. Deionized Water, Sodium Laureth Sulfate, Polysorbate 20, Cocamide MEA, d- Limonene, Cocamidopropyl Betaine, Sodium PCA, Allantoin, Triclosan, Polyquaternium 10, Hydrolyzed Mucopolysaccharides, DMDM Hydantoin, Tetrasodium EDTA, Citric Acid, Extracts of Aloe Vera, Clove, Lavender and Thyme, FD&C Blue #1, Fragrance.